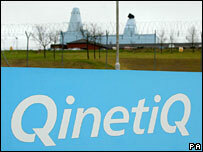 Defence Secretary John Reid has defended the privatisation of military research group Qinetiq. His comments come a day after spending watchdog the National Audit Office (NAO) said it was to examine the sale of a 31% stake in the firm in 2002. The NAO is to look into whether the shares were sold off too cheaply to US private equity firm Carlyle. Carlyle is now due to make a 780% profit return as the government sells off its remaining stake in Qinetiq. Qinetiq is expected to have a stock market value of up to £1.3bn ($2.31bn) when the shares float next month, with Carlyle standing to make a profit of up to £370m from its original £42m investment. Mr Reid said the NAO probe was routine and that Carlyle's expected profit merely reflected the value the US firm had added to Qinetiq over the past two years. "The taxpayer, for those shares we are now selling off, is getting eight times as much for those shares as we could have done in the market a few years ago, precisely because of the value that has been added there," he told the BBC. "This is precisely why the MoD [Ministry of Defence] brought them in. "The MoD is very good at certain things, but it is not necessarily very good at running companies." Mr Reid added that the NAO was investigating, "not because there is a scandal, but because it is pretty routine for the NAO to investigate these things after the event, we welcome that." Qinetiq has developed all kinds of technology over the years - including radar systems and liquid crystal displays.